The following tutorial demonstrates how you can make RadSpellChecker check a simple text-editing control - RadTextBox. Before executing the following steps, please make sure that the target framework of the project in which you are going to use RadSpellChecker is .NET Framework 4.0. 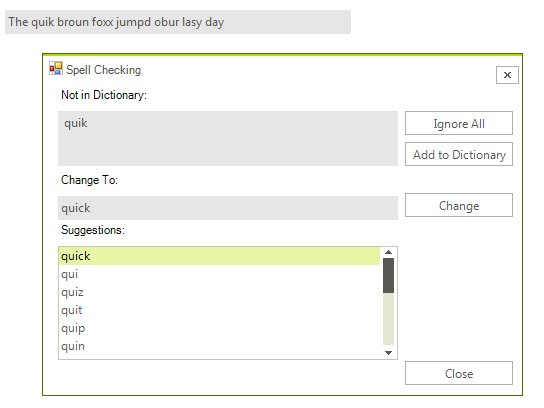 This will allow you to see RadSpellChecker in your Toolbox and work with it. 1. Drag and drop RadTextBox from your Toolbox to your form. 2. Drag and drop RadSpellChecker from your Toolbox to your form. 3. Drag and drop RadButton from your Toolbox to your form. When clicked this button will invoke the spell-checking capabilities of RadSpellChecker. Me.RadTextBox1.Text = "The quik broun foxx jumpd ovur lasy dog"